Two years ago whilst visiting Sydney, I was lucky to stumble across ‘Vivid Live’. Self-described as a ‘festival of Light, Music and Ideas’, the event is a contemporary twist on an Arts festival that sees the marrying of Art and technology. 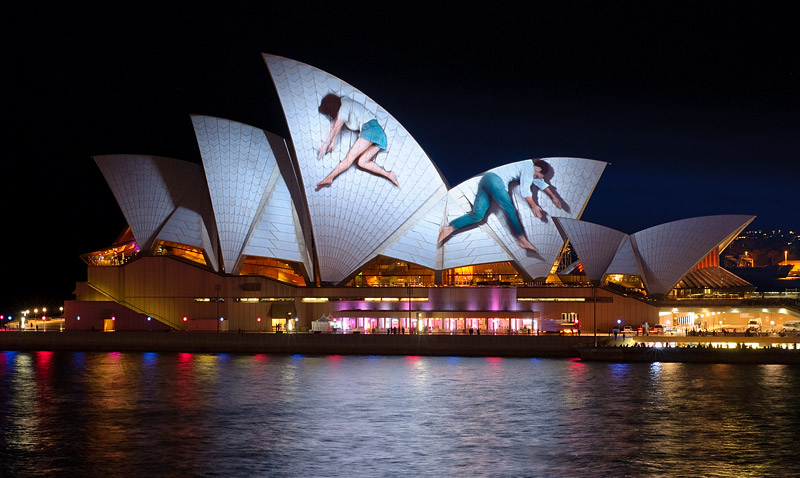 Perhaps the crowning jewel of the festival is the Lighting of the Sails, where a video installation is projected onto the exterior of the Sydney Opera House. This process of 3D mapped projection uses specialized software to warp and mask the projected image to make it fit perfectly on irregularly shaped screens. The 2012 projection I encountered was created by German design collective URBANSCREEN. (See here http://http://www.youtube.com/watch?v=o5ZvCv7yUKk) Upon witnessing it I was captivated by the awe inspiring visuals. The technology made the Opera House and the landscape around it feel so dynamic, in that moment. It was the first time I had seen 3D mapped video projection in the flesh and a fascination had been ignited. For the past two years I have been studying Landscape Architecture. The design project I am working on at present, the Heygate Estate, has had me recounting this experience, specifically the animation of landscape at dark. I find it alarming how many landscape projects, appear not to consider a scheme after sunset, especially when during the day their design seems very comprehensive and successful. I do not propose that landscape architects contribute to the transformation of our cityscape, to a Blade Runner-esque one, with advertising-laden buildings at every turn. The advertising industry unsurprisingly is pushing 3D mapped projection technology forward, with Ralph Lauren, Bombay Sapphire and Guinness, having all utilised it across London. No I suggest we are inspired by the dazzle of these temporary installations, and incorporate it and technology into our designs. For, lighting can redefine or reinforce the identity of a space, bring it to life at night and even make it a destination. For those wishing to see this technology, it is possible today (March 13th) in Trafalgar Square, the projection of a new Banksy work onto Nelson’s Column to mark the third anniversary of the ongoing conflict in Syria. Finally, May 2014 will see the Lighting of the Sails projection created by British group 59 PRODUCTIONS.